"Every time I roll out my mat I am reminded on why I love this practice so much. Connections, Peace, and Safety are just a few of the reasons why I fell in love with Yoga. The Asana (postures) is just part of the practice; the real practice begins off the mat." Danielle is a mother of three, wife, daughter, and friend to all. In her professional life she spent 10 years working with victims of sexual assault and domestic violence. 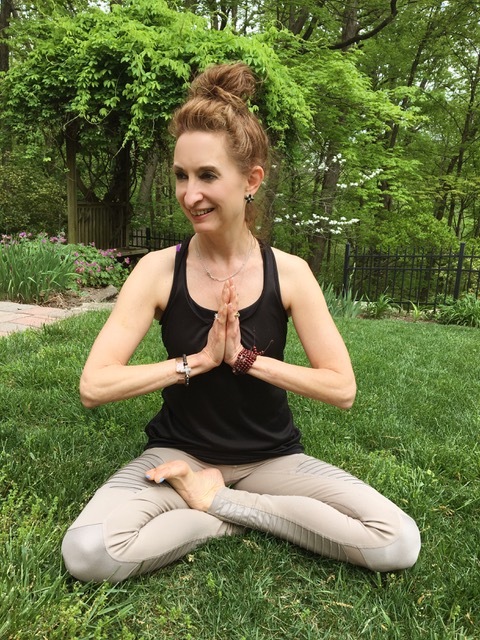 She is trauma sensitive and cares deeply about her students and wants each person to find the inner safety and peace in their Yoga practice; that she has found. Aloha is rooted in two words which describe that greeting: alo, being in the presence of; and ha, breath of life; the life force. Thus, aloha means " in the presence of breath, our life force." I feel aloha in my relationships with my family, nature, challenges lost and won, and conscious movement. Mana is a foundation of the Polynesian worldview, a spiritual quality with a supernatural origin and a sacred, impersonal force. To have mana means to have the ability to perform in any GIVEN situation. Mother nature is a stern and loving teacher; and the cycle of life affords us the opportunity to come into the union or flow of it all: or resist it. There's always choice! The only thing I know for sure is that you are strong enough to hold it all. When that's realized; that's mana. I’m Brittany. I am a medical assistant for TriHealth. I also teach dance to all ages. I have been dancing since I was 4 years old. I danced 24/7 and performed at competitions. After years of training and performing my time was up, I knew I needed to share my love of dance with others. During a rough period in my life I needed help. I needed to find myself again. I turned to Danielle for help and she guided me to Aloha. The studio has been a great inspiration in my life. I have found who I truly am. I know what I want, need and should give to the world. When the opportunity came up to become an instructor, I had the same feeling teaching dance gave me. I get to share my love and passion with others and help others find their true self’s and so much more. Hi, my name is Christy, I am a mother of 2. I love being with family n friends, playing volleyball, vacationing at the beach and practicing yoga. I was introduced to yoga while vacationing in Mexico roughly 6 years ago, i couldn't wait to get back to the states to find a place! I went to a hot yoga practice and was instantly HOOKED! I was in and out of classes for years till the chance to become a yoga instructor came to me, i new right then and there, deep down, this was meant to be. Yoga is such an enjoyment and i cant wait to spread the love i have to all that shows up on the mat. See you soon! I had started yoga as a supplemental workout to lifting weights and circuit training. It was just supposed to be a change of pace workout to help with my flexibility and injury prevention. It very quickly escalated into something very much more. I soon found myself on my yoga mat way more often than at my gym. The connection of breathe and movement was something that I had never experienced before and the moving meditation that yoga is has become a staple in my life. It keeps me centered and helps keep all the negativity that can be encountered in the world from sticking to you and bringing you down. Hi! My name is Riley. I am the founder of Grounded by Riley, a holistic health coaching service for modern women wanting to live a more mindful life. In my free time, I love to read, be by the ocean, cook delicious vegan food and snuggle with my dog. Yoga found me during a very scary and transitional time in my life. It is my safe space, a place for me to ground myself and connect with the Universe. Yoga is my practice of self-care, self-love and self-exploration. I feel honored to be a guide to yogis of all levels of abilities. My intention in each class is to spread fun, positive energy and love. I hope to see you on the mat! My Journey to yoga began 40 years ago, when I met my first yoga teacher, Dr. Vjendra Pratap. Learning that yoga is a journey to the self, a realization that we are fantastic as he would always tell us. My passion and my joy come from seeing the light in others, and sharing the practice of yoga with others. I'm always delighted to meet others on this life changing path, seeing the light in each and everyone. Hi! My name is Kelly, and I'm a mama of 3. I love watching my kids play sports, being by the ocean, and camping with family and friends. My yoga journey began when I was searching for relaxation tools. The first time I stepped into Danielle's class, I knew this was different. I have struggled finding exercise that I could stick to, but yoga is also so much more than asana. When the chance to become an instructor came up, I knew this was my calling. I love how yoga really is for every BODY, and I can't wait to see where this journey takes me. See you on the mat! I started practicing yoga 13 years ago when I was pregnant with my second daughter, Natalie. Yoga was the one thing I could do that not only made me feel good but also allowed me to get a little exercise in. After my daughter was born I continued with yoga – trying different types but ending up really loving heated yoga where my muscles felt more open. My teaching journey started in May of 2015. I wanted a deeper understanding of yoga, so I decided to obtain the 200 hour teacher training, but I honestly didn't plan to teach. However, a few opportunities presented themselves and I quickly discovered how much she loved to teach. It’s such a pleasure seeing people progress through their practice really discovering the full benefits of yoga. There is definitely a greater force out there leading us on our path of destiny and often you find that the journey is completely different than what you expected! After being told for years by numerous people that I should try yoga, Aloha opened near my home and I took it as a sign to take the plunge. My first class was truly a revelation; I knew this was a lifelong love affair from the very start. What began as a way to exercise and relax quickly became something much deeper. Yoga has become second nature to me; I have come to understand that it isn't just something that you do in a studio. It's something you carry inside of you every day of your life and everywhere you go. It connects my deep love of nature, my spiritual beliefs, my mind and my body in a way I never anticipated. When the chance to become a teacher came up, I knew deep down I had to do it. Yoga is a gift I feel compelled to share and I am so grateful to have the chance. Before I found yoga, I was unconsciously looking for a way to connect my mind and body in my faith. I needed to step away from the coordinated chaos of keeping up with my family’s day-to-day activities (4 kids, husband, dog & car), while nurturing my faith. I also wanted (needed!) to make my body stronger and healthier. I fell in love with the yogi lifestyle - it encompasses everything I cherish; a mental break so I can show up fully and present for my family, a challenge for my body, and a time to connect deeper to my faith while being true to myself. A chance to find peace in the constant noise of life. An opportunity to move deliberately and consciously. Teaching yoga quickly rose to the top of the list of what I wanted to be when I grow up. In my classes, I hope to help you slow down, take time for yourself, & create a space where you can feel confident, supported and strong. My goal is to challenge your mind and body to become the best you can be for not only your family and friends, but yourself. Hi! My name is Kara. I enjoy being outdoors, spending time with my family, singing, practicing yoga, and being upside down. When I roll out my mat, I feel a sense of peace, mindfulness, beauty and connection. I started digging deep into my yoga journey shortly after I gave birth to my daughter, Josie. Yoga became an outlet for me as I adjusted to being a new mom, and my practice has provided me with balance in my day to day life. It is where I come to fill up my cup so I can be of service to others throughout my day. My intention is to inspire my students along their journey by being in the present moment, challenging them in a way that promotes self growth and self care, and to reconnect the body and mind so they can fully embrace every aspect of themselves. All levels are appreciated and welcome. I enjoy meeting all students wherever they are at in their practice. I hope to see you on your mat! Some of my passions in life include rock climbing, traveling, music, reading, and learning. I am the oldest of 5, and have a 4 year old English Bulldog named Elvis, who loves being out in nature just as much as I do. I started practicing yoga in 2016 after suffering an injury and having difficulty overcoming it. At first, yoga was simply a way for me to get through my injury and feel better physically. 3 years later, it means so much more to me than I could have ever imagined. For me, yoga is a way of life. It is the greatest tool to connect mind with body, while gaining a more spiritual connection with this world. As I dove deeper into my practice, I started to understand the true beauty of yoga, as well as the many doors it can open in your life. I hope to inspire others to take this incredible journey, and am honored to be in the position to do so. I am a Physical Therapist who loves traveling, good food, wine, my dog, and of course yoga! As a PT, I was first drawn to yoga for its physical benefits. I loved the idea of a physical practice in which the goal is to bring balance to the body with strength and flexibility. As my yoga practice grew, I found that there is so much more to yoga than a physical asana practice! I decided I wanted to learn more about this ancient art, and in the Winter of 2015 I traveled to the jungles of Costa Rica to complete my first yoga teacher training at Marianne Wells Yoga School. I never imagined that yoga would help with my mental and emotional health as much as my physical health, and that it could nourish my soul as well as my body. I am always a yoga student first, and am currently working on my advanced teacher certification through World Peace Yoga. I continue to love to practice and teach all aspects of yoga, and hope to share the peace and happiness that I have found on my yoga journey.